Below are common attributes associated to Chapel Hill Yellow Lantana. Become a care taker for Chapel Hill Yellow Lantana! Below are member comments regarding how to plant Chapel Hill Yellow Lantana. No comments have been posted regarding how to plant Chapel Hill Yellow Lantana. Be the first! Do you know how to plant Chapel Hill Yellow Lantana? Below are member comments regarding how to prune Chapel Hill Yellow Lantana. No comments have been posted regarding how to prune Chapel Hill Yellow Lantana. Be the first! Do you know how to prune Chapel Hill Yellow Lantana? Below are member comments regarding how to fertilize Chapel Hill Yellow Lantana. No comments have been posted regarding how to fertilize Chapel Hill Yellow Lantana. Be the first! Do you know how to fertlize and water Chapel Hill Yellow Lantana? Below are member comments regarding how to deal with Chapel Hill Yellow Lantana's pests and problems. No comments have been posted regarding how to deal with Chapel Hill Yellow Lantana's pests and problems. Be the first! Do you know how to deal with pests and problems with Chapel Hill Yellow Lantana? Looking for Chapel Hill Yellow Lantana? Get Chapel Hill Yellow Lantana fresh and large directly from the grower to your garden! 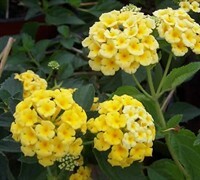 Buy Chapel Hill Yellow Lantana online from the nursery wholesalers and save BIG! Plant lantana in garden or landscape beds that provide very well-drained soil and plenty of sunshine. A little shade won't hurt. Prune hardy lantana when new growth begins to emerge in spring. At this time remove all dead branches. Fall pruning almost ensures death of the plant! A light mid-summer shearing to remove spent flower heads and encourage heavier flowering is okay. Lantana aren't heavy feeders. I usually fertilize them with a slow-release flower food in spring, after new growth has started to emerge. Lantana are generally pest and disease free. Constantly wet or soggy soil can cause problems with the roots. I seen occasional insect problems but nothing that poses any serious threat to the plants. Because butterflies and other beneficial insects love to feed on the flowers of lantana I never spray them with any chemical.